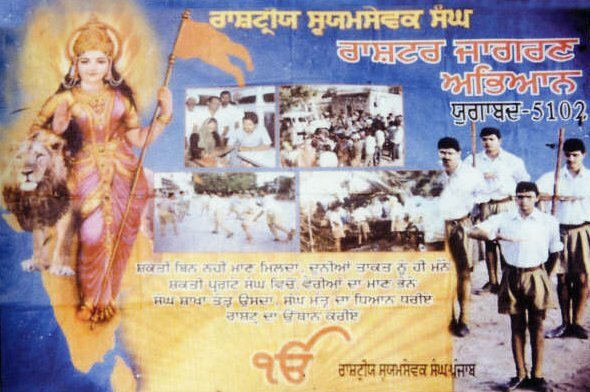 Last week a cadre of khakhi wearing Rashtriya Swayamsevak Sangh (RSS) radicals marched into a religious function at Gurdwara Fatehgarh Sahib and shouted the slogans of “Har Har Mahadev, Har Har Mahadev !” The right-wing fanatics were invited to the Mata Gujri Ji’s Sra and the sacred martyrdom site of the younger Sahibzadas by the ruling Badal family and the psuedo-Akalis. What a fitting tribute the Sahibzada Baba Fateh Singh and Baba Zorawar Singh Ji’s martyrdom! While the Panth recognizes the Sahibzada’s Shaheedi as the ultimate sacrifice for humanity, the RSS hopes to reduce the legacy of sacrifice as mere “Indian Nationalism.” The shameless Akalis, blinded by their zeal to garner votes and stay in power, allow such debacles to take place on our sacred grounds. What will be next—the installation of Mahadev’s idols in our sancta-sanctorums? Will history repeat itself? After 130 years, the Sikh community is being targeted in the same manner it was during the later part of 19th century. After the fall of the Sikh Kingdom in 1849, major Sikh institutions fell into the hands of the Mahants. Idols of Hindu deities were installed in Sri Darbar Sahib Amritsar, Tarn Taran Sahib and other Gurdwaras. In 1875, the Arya Samaj (the pre-cursor to the RSS) firmly established itself in the Sikh homeland thanks to Swami Dayanand and his protégés. They began to preach that Sikhism was simply a branch of Hinduism, and openly began to denounce Sri Guru Granth Sahib Ji and the teachings of the Sikh Gurus. The Sikh scholars countered the Arya Samaj propaganda by establishing Singh Sabha Lahore and Amritsar. Unfortunately, the two Singh Sabhas did not see eye to eye on some key and crucial points. 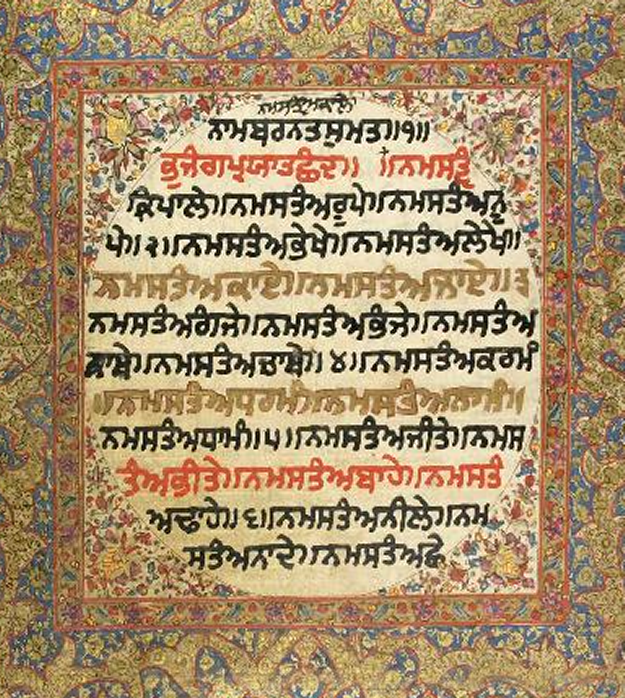 While Giani Ditt Singh and Bhai Gurmukh Singh’s ‘Tat-Khalsa’ group saw the Sikh Nation as a unique entity, the Amritsar based ‘Sanatan’ group, led by Khem Singh Bedi and others had very liberal views about the distinct Sikh identity. Not unlike the views of Dayanand, the ‘Sanatans’ also viewed Sikhs as a branch of the greater Vedic pantheon. With determination and the eventual support of the Sikh masses, the Panthic Singh Sabha eventually prevailed, leading the way to the renaissance of Sikhi that continued well into the first quarter of the 20th century. Sidelined and marginalized, the ‘Sanatan’ group began to make alliances with others pro-Sanatan groups who were also threatened by the energetic revival efforts of the Tat-Khalsa groups. They included the hereditary Mahants, Pujarees, pseudo-Nihang and the Sodhi, Bedi, and Dhirmali families who in the past had openly worked against Panthic interests and felt no love towards the Tat-Khalsa revivalists that threatened their hold on key Gurdwaras and Sikh institutions. Through determination, sacrifice, and the loss of many lives, the sancta-sanctorum of our Gurdwaras were cleansed of Hindu idols and rituals, and freed the community from the clutches of Brahmanism and the corrupt Mahants and their cohorts. It seems as history is repeating itself, modern day Akalis have now replaced the Mahants, the Rashtriya Swayamsevak Sangh (RSS) has replaced the Arya Samaj, and joining hands with them are modern day Akali Politicians, and Sanatanists like Virsa Singh of Delhi, and their ‘Nang’ adherents in the west. Their message and their target remains the same as it was 130 years ago. Both the RSS and the Sanatanist-Nangs have taken a leading role in propagating the same warped ideology under the garb of Sikhi, Nihang, and Gatka related websites. Popularly coined terms include “Sanatan Hindu-Sikh", "Sanatan Shastar Vidya,” “Shiv-Akhara,” “Shakti-Shakta,” “White Tantrik", "Sikh Kundilini”, etc. Rashtriya Swayamsevak Sangh and its offshoot, the Rashtriya Sikh Sangat are well known for their continuous anti-Sikh parchar. The Rashtriya Sikh Sangat propagates that Sikhs are “Keshdhari Hindus” and are an inseparable part of the larger Sanatan-Hindu dharma. Such blasphemous allegations were the key reasons that led Sri Akal Takht Sahib to call for the boycott of the Rashtriya Sikh Sangat in 2004. 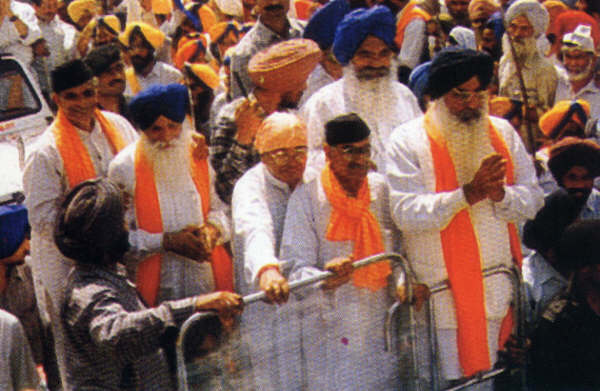 The boycott instructed the Sikh community to not interact or support the RSS or any of its affiliates in any manner. A Yogi-Bhajan follower’s Gatka website advertising Hindu symbols and graphics. Note the intentional distortion of the ੴ symbol. “As always, the Durga Puja pandal at PC is turning out to be magnificent and this year’s theme is Golden Temple, Amritsar. Although not yet completed, with ornamentation and much of the frills yet to be done, it is strikingly similar to the original masterpiece. It is one of the biggest Pujas in Kolkata with millions thronging the Puja fair, which lasts well over a month after the Pujas are over..."
Over a hundred years ago, the Mahants brought in Hindu idols into our Gurdwaras in order to muddle our distinct identity, and mislead the innocent public. This time it is the Akalis themselves who at one time ousted the Mahants who are working hand-in-hand to dilute our unique culture and beliefs. The Sikh Nation must be vigilant of the nefarious designs of our modern day Mahants and their Sanatan sympathizers. It will require 21st century variations of the Singh Sabha movement, Chief Khalsa Diwans, and Gurdwara Reform movement to counter the ongoing challenges. It is just like a 'Food' Court in a big business (religious) complex. Everyone wants your quid.